have the Awakened formed together in unity and purpose. the blocks from which shall be built a new city. each Hallow a jewel in its treasury. At the price of death." The Fallen World resists the efforts of mages to impose higher realities onto the mundane laws of nature. The very disbelief of Sleeper souls can unravel spells, but mages can build strongholds that establish a foothold for their Supernal Realms. In these sacred sites, mages can perform wonders akin to those of their Atlantean ancestors. A detailed look at mage society and its sectarian politics, from its Hierarch leaders to its Sentinel enforcers. 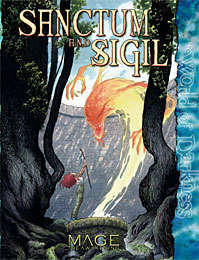 Reveals the inner world of mage sanctums and demesnes, anchors between the mundane world and the Supernal Realms. Example sanctums for both Atlantean orders and their rivals. Details on the Protocols and Great Rights of mage cabals, and the laws of the Lex Magica presided over by the Consilium. Expanded rules for the sanctum, Hallows and ley lines, including new Merits and spells. Information on Seers of the Throne pylons and Banisher cults, including sample groups.